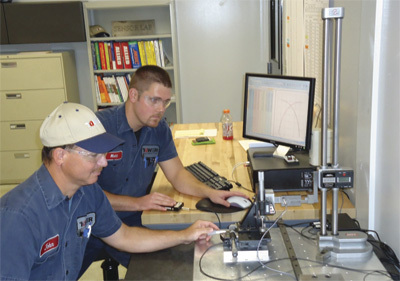 Sensor-applications specialists John Moore and Matt Reynolds test sensors in the Tower Automotive error-proofing laboratory. I rarely witness stamping tooling as beautifully and thoroughly sensored as what I recently spied at the Tower Automotive facility in Bardstown, KY. All too often I see transfer tooling with sensors only mounted on the transfer arms. But what about the monitoring of parts as they release from the gripper fingers? Often these parts tend to take on the characteristics of airplane wings, floating down to their respective die sections. Just how does one know if the parts seat (nest) properly within the lower tooling? And how do you know that the parts are properly placed on the lifter? Well, the folks at Tower Bardstown have answers to these questions, thanks to the use of sensors mounted deeply within its transfer and progressive tooling. It all starts with an unwavering plant-management commitment, spearheaded by plant manager Shawn Callahan and his managerial and technical staffs. Callahan appointed two full-time people to serve as sensor-application specialists, tasked with developing an error-proofing laboratory. They meet weekly with an error-proofing technology committee and to implement, along with the assistance of the toolroom and tool-engineering departments, electronic sensors throughout the plant’s numerous existing and future progressive and transfer tools. Electrician’s conduit, with the appropriate fittings and mounting hardware, protects the sensor wiring. The plant’s sensor-applications specialists: John Moore, a 21-yr. veteran of the tool-and-die-making profession with Journeyman Toolmaker credentials and an Associates Degree in Machine Tool Technology; and Matthew Reynolds, a graduate of the Tower Tool and Die Apprenticeship Program and who also boasts an Associates Degree in Machine Tool Technology, along with an Associates Degree in Business Management. 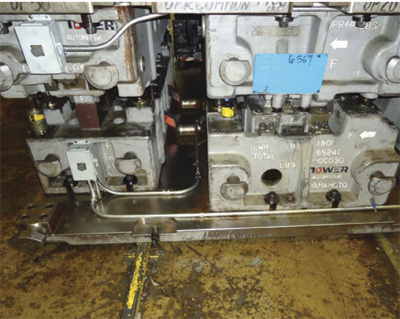 Moore, Reynolds and their team began their die-sensoring efforts by focusing on a transfer tool with more than two dozen sensors located throughout the upper and lower sections. The sensors ensure that, among other monitored events, parts are placed properly on lifters before the press is allowed to close. Previously, the tooling would all-too-often mash parts and/or crash the sections where the parts—once released by the transfer mechanism—did not land on their assigned lifters and/or did not properly nest within the lower sections. Since adding the sensors, the transfer tooling runs faster and unattended, as the operator no longer needs to nervously patrol the process. An electronic sensor mounted within a stop block monitors shut height. The craftsmanship exhibited by Moore and Reynolds is evident in the they protect the wiring in the tooling. They meticulously route electrician’s conduit, with the appropriate fittings and mounting hardware, to protect the sensor wiring. 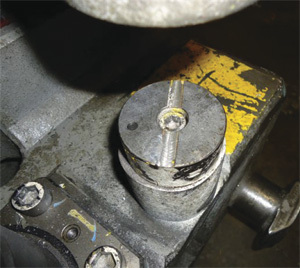 The sensors are bunk-ered within blocks of steel or within existing tooling components (such as the lifters) to protect them from accidental damage as the tooling moves in and out of the press. Cabling from the die-protection control is comprehensive in that it contains the ability to connect scores of sensors, if needed, with a robust military connector. As a result, die-change times are minimally, if at all, affected by the addition of the sensors. A key to the sensor-program’s success is the thorough bench testing of sensors in the error-proofing laboratory. The days of testing sensors only on the shop floor during production runs are over at this facility. And, Moore and Reynolds work closely with the plant’s die engineers to ensure that appropriate wiring channels and mounting details are designed into new tooling, rather than implementing sensors as an afterthought.